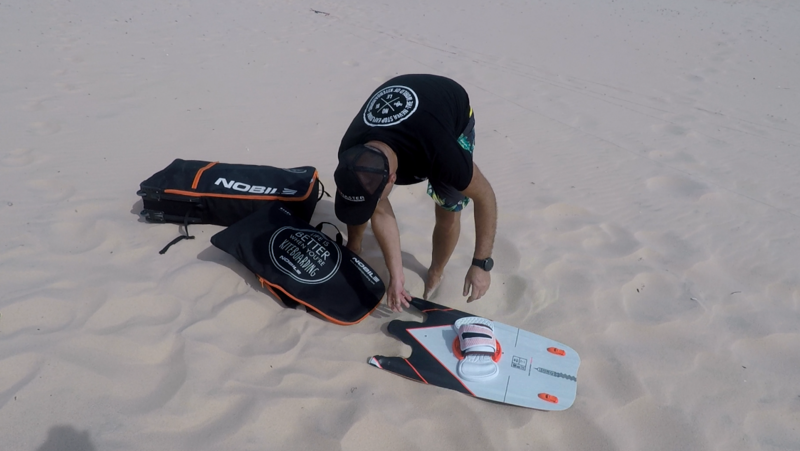 At the end of last year, thanks to Nobile Kiteboarding, I had a pleasure to test the NHP Split 2019 (138/43 cm) board. Is it worth to buy the Nobile NHP 2019 Split? Does is make travels easier and cheaper? Is it really true, that you don’t have to pay for “sports” baggage in airlines, taxis and buses? And finally – does it perform just like the “normal” TT board? In this review I’ll try to answer all these questions. I’m convinced to the split solution, but I’ll describe you how does it look in practice. Last November me and my daughter Julka went to Gambia in Central-Western Africa – a tiny country located in the Gambia river basin, but also with 70-kilometre coast of beautiful beaches by the Atlantic Ocean. Due to wind conditions and upcoming weather we didn’t take a quiver full of kitesurfing equipment, only one Nobile Check-in Bag which contained everything we needed: Nobile T5 kite, Nobile NHP Split (138-43) board, bar, pump, two harnesses and other stuff, more or less handy in tropics. At the airport the luggage “bag” made no impression on anybody – its weight (20 kilograms) was just right and it was treated as standard check in bag. The flight with stopover in Barcelona went smoothly and after almost eight-hour journey Gambia welcomed us with a hot, tropical night. Next day some wind had been forecasted so we got up early. From the hotel balcony we saw whitecaps at the river mouth. Julia attracted a lot of attention, unfolding the kite, while I connected the board in... 30 seconds! The assembly of IFS PRO set – fins, pads and straps – took five minutes, without any single tool like screwdriver. It’s another asset of this board. Julia made a few tacks, but the wind stopped right after and she had to walk for a while. However, she returned satisfied, as she had probably been the first Polish girl who rode at the Half-Die spot in Banjul. In general, the conditions were poor until the end of trip. The morning ritual was repeating itself. From dawn to ca. 10 am the wind blew at 10-13 knots, so I couldn’t make all the best of a new equipment. In the afternoon there was a time for surfing on Kotu Beach and travels. A week passed on chillout and surfing, but I missed a good kitesurfing, so... right after we returned, I checked the weather forecasts and started to looking out for cheap tickets to... Vietnam! The water and air temperature around 30 ˚C. Climate, cheap everyday life, 25-knot winds and 3-metre waves. Sounds nice, doesn’t it? 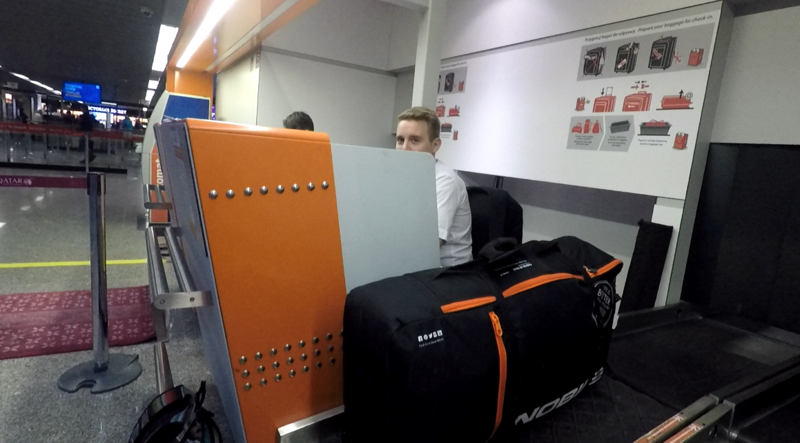 At the airport the luggage situation was the same. Although this time Nobile Check-in Bag weighted almost 30 kilograms, it was declared as a standard baggage without any extra costs. The flight to Ho Chi Minh with a stopover in Doha, Qatar (where I recommend the City Tour, if you have to wait four or more hours for the next flight) passed in extremely comfortable conditions. Mui Ne welcomed us with perfect conditions: wind at 25 knots, waves and beautiful sun! And so it was until the very end of our two-week trip. I won’t describe the spot and sessions, but I will gladly share my expressions from the split ride, without using abbreviations of advanced technologies like EPC, CAV, TRAX or DAS. Why? Because I’d like to share with you my personal, subjective feelings in simple words, clear for every kitesurfer, more or less advanced, and answer the question: Is Nobile Split board good and for whom? 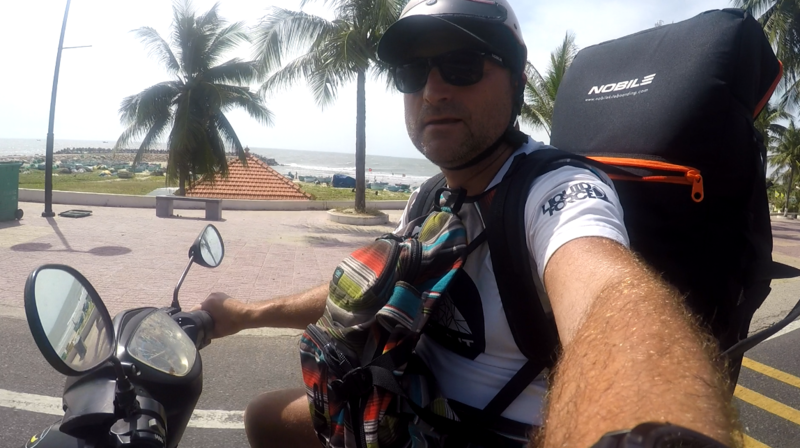 The first session in Vietnam was a strongly waved spot in Main Beach. 25 knots of wind and 2-3-metre breaking waves – those were the conditions I used. Perfect for my basic 10-metre Nobile T5 kite. The board enters the slide surprisingly fast and is very precise in steering, thanks to channels at the bottom, and compared to other flat boards, even a semi-advanced rider can feel it. My fears of board’s rigidity were easily dispersed by first few tacks and high jumps. This Nobile model is called NHP (Nobile High Performance) not without reason and it’s a next generation of legendary boards line of this brand. The board is asymmetric, which means wider at backside and heels, allowing better and more effective upwind performance. Beating the breaking wave also didn’t make any problems, thanks to slight bend of the board, called the rocker. I used the board for the following two weeks, almost every day, in different conditions, and each time it gave me a lot of fun. I recommend it confidently for everybody, even novice kitesurfers who buy equipment “for years”, visit world spots with it and improve their skills in riding and jumping, of course. This model is also for advanced competitors, as it doesn’t fall behind the whole line of non-split boards, when it comes to pop or rocker. My observations have been confirmed by few participants of Nobile Demo Day that I organized at the nearby Malibu Beach. The board was red-hot and praised by another testers, one of whom wanted to buy it from me immediately. However, I had few days of riding left, so he had to leave empty handed. Is it worth to buy Nobile NHP Split? Definitely YES! Travels and sessions in the water with THIS equipment are a great pleasure. All the arguments you will find in the above text. 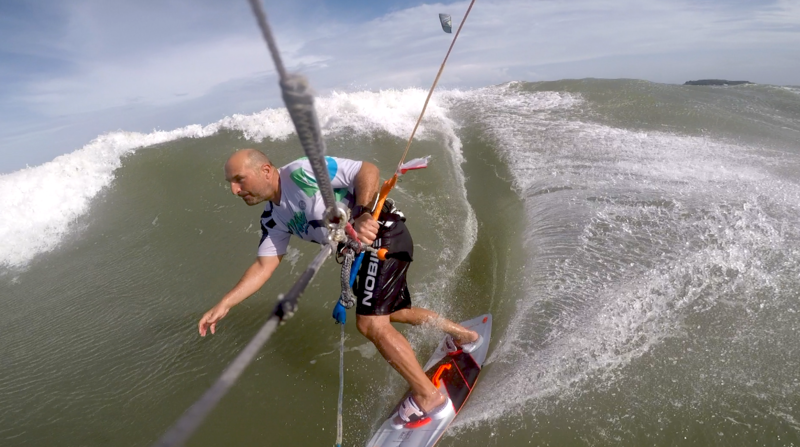 Janek Lisewski is a traveller and ultrakitesurfer. In 2005 he gave up work in corporation and since then he has been a kiteboarding and snowboarding instructor, while in his spare time he fulfils his sports achievements. In July, 2011 as the only man in the world, he crossed the sea alone on kitesurfing, establishing the world’s record. He rode the 207.5 km route from Świnoujście (Poland) to Kasenberga (Sweden) in 10 hours and 43 minutes. In August, 2012 within the “SUP Projekt Wisła” [SUP Vistula Project] together with Tomasz Stobiecki he travelled almost 1000 kilometres by the Vistula river, from Oświęcim to Gdańsk, paddling on the SUP paddle board, what turned out to be the longest surfing board journey in Europe. 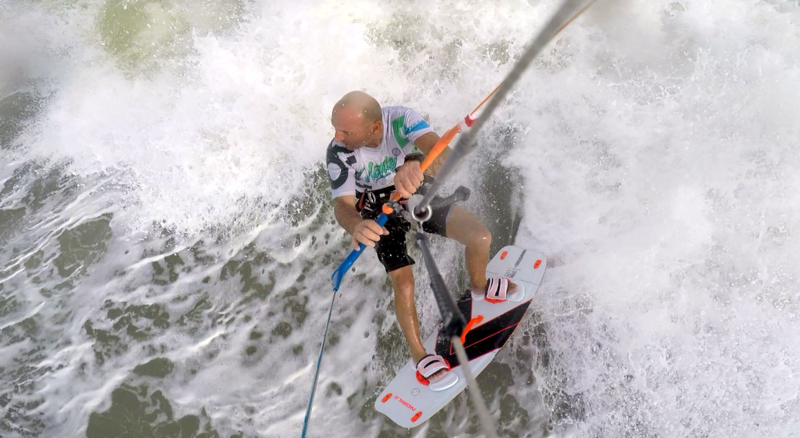 In September, 2015 Janek crossed the Adriatic Sea on kitesurfing, from Croatia to Italy. In September, 2013 he beat the Guinness record in the longest, 24-hour kitesurfing (strapless) cruise (August-September, 2013). He also took part in 213 RED BULL COAST 2 COAST race. In 2015 he crossed the Adriatic Sea from Croatia to Italy. In September 2017/2018 Janek completed the Aral Sea crossing in Kazakhstan.